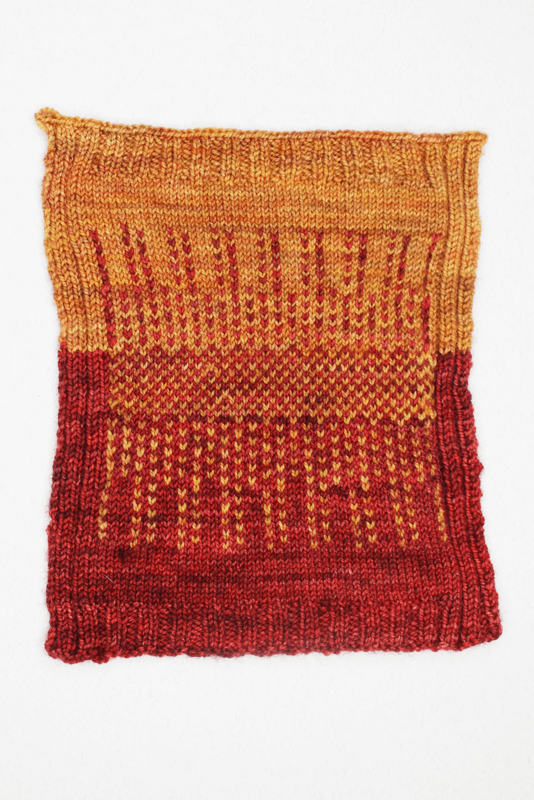 We’ve covered a lot of ground so far in our how to swatch your knitting series. We’ve gone over the basics of why swatching is so important for a polished and professional-quality finished object. Then we showed you, step-by-step, how to create accurate swatches you can trust each time you start a project. For the final installment of our how to swatch series, we wanted to share a few advanced techniques that will really help you take your knitting to the next level. Generally speaking, swatches are made using the stockinette stitch in order to find your stitch and row gauge. You need to know these numbers so you can be sure that your finished work will be the appropriate size. This is especially important when you’re making a garment because it will directly affect how well a piece fits you or the intended wearer. So what happens when you’re working with a stitch pattern that could drastically alter the gauge of your project? If you’ve ever knit anything with cables or worked a fair isle pattern, you might have noticed that your final piece was a different size than you expected or that your gauge felt very different when you were working those particular sections. 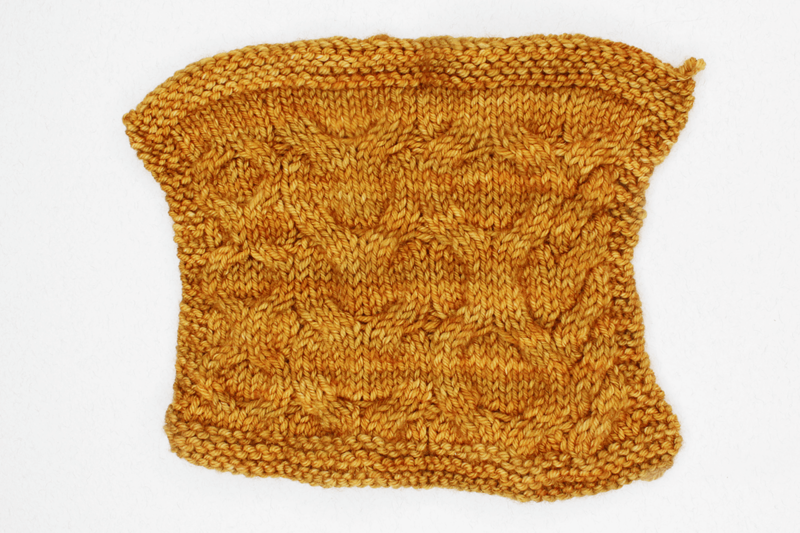 If you’re following a pattern a lot of times this work has been done for you and the pattern might simply ask you to make a stockinette swatch because the author has already done some of the work for you within the pattern. She has determined that if you knit a stockinette swatch to the gauge she has referenced, your final project, even with the cables or the colorwork she has incorporated into the design, should work. However, sometimes patterns do instruct you to create gauge swatches in pattern so that you can be sure you’re going to knit the garment as accurately as possible. And if you’re interested in designing your own patterns, learning how to swatch in various ways will make designing easier. Your final patterns will be more successful because you will know for sure that all of your measurements are going to be accurate across all the sizes you’re supporting. One important note before we start: All of these swatches should be blocked or washed as you plan to treat your finished garment. Whenever you find your gauge you should record the stitch and row gauge both before and after you block your swatches. Your knitting tension can be affected by a variety of things including what you’re knitting. When you work with two or more yarns at a time in stockinette stitch, you might find that your tension is different from your regular stockinette knitting. This can be caused by how you’re holding the yarns as you change colors or even the different dyes in the yarns themselves. Regardless of why the change is happening, it’s good to be aware of it and make a swatch of one of the colorwork sections of your garment to be sure that your colorwork won’t throw off the fit of the final piece. To find your gauge, you’d count your stitches the exact same way you would a regular stockinette gauge. Lay your ruler over the swatch and count how many stitches make up an inch both horizontally (stitch gauge) and vertically (row gauge). Fair Isle is usually knit in the round because it makes the patterns easier to work when you’re only knitting the right side of the fabric. With that in mind, let’s talk about how to swatch in the round! If you’re going to knit in the round it’s important to make your swatch in the round as well. When you knit stockinette stitches flat, you’re making knit stitches on the front of your work and purl stitches on the back. When you work stockinette in the round, however, you’re only making knit stitches on the right side. This affects your gauge because your tension when you’re purling can be different than your knitting tension. 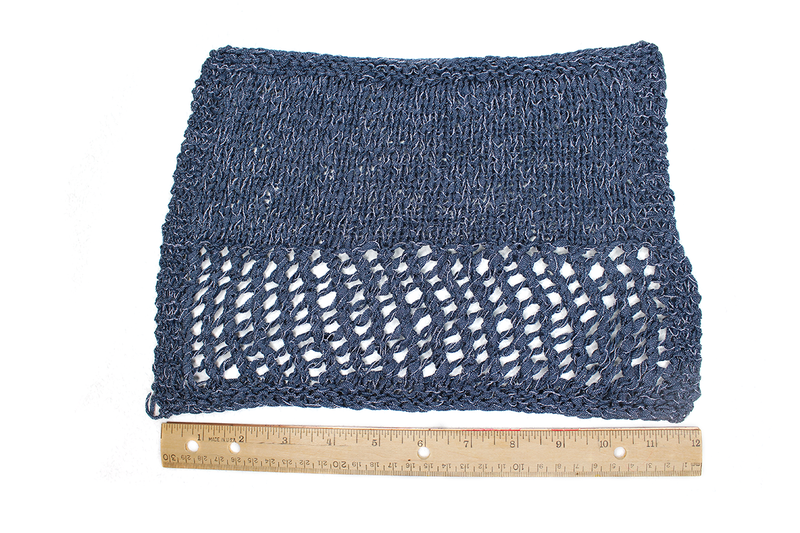 When I knit a top-down raglan sweater, for example, anytime I need to knit flat—when I’m starting the back of the neck or working a short row bustline—I often need to use a different needle size to match the gauge of my circular knitting. Don’t worry about the first few stitches and the last few stitches. They’re going to be a bit loose and weird because you’re carrying the yarn around the back of the work instead of knitting a full circle. As long as you cast on plenty of stitches, they won’t affect your gauge. When you carry the yarn, you need to use a little more than the length of the swatch to be able to knit across your swatch comfortably. If you don’t leave enough slack in this carried yarn, you’ll notice it will become difficult to knit across your swatch. Once your swatch if finished, you can cast off and measure your gauge like it was any other swatch! Just make sure to stay towards the center of your work so your measurements are not thrown off by the looser stitches at either end. Sometimes a pattern may instruct you to figure out your gauge for a repeated stitch pattern. And if you’re at all interested in designing knitwear, knowing how to find your gauge in a pattern will be integral to figuring out all of the other technical details required in pattern writing. Finding this gauge is just like finding a stockinette gauge, it’s just a little trickier and you need to really know how to read your stitches. Since reading your stitches is such a great skill to have anyway, it’s a good idea to get into the habit of finding your stitch gauge for repeated pattern sections so you’ll be better equipped to figure out mistakes and solve them more easily. If you wanted to knit a cute beach cover up with that open, meshy stitch pattern, but you only found your stockinette gauge and not your gauge for the mesh as well, your final garment would most likely end up way too large! So how do you find your pattern gauge? The first thing to do is figure out whether or not you should knit your swatch flat or in the round. Sometimes the answer is both! For the top down raglan sweater I mentioned above, I needed to figure out both my round and flat gauge for a pattern I decided to use around the yoke as well my round and flat gauge for the stockinette stitches I planned to use for the body and sleeves. There are two other things to keep in mind when figuring out your stitch gauge and your row gauge for any kind of stitch pattern. How many stitches make up one complete set of the stitch pattern as you knit across? The number of stitches between the two vertical lines indicates each repeat of the cable pattern. And how many rows make up one complete set of the stitch pattern vertically? The number of stitches between the two horizontal lines indicates the number of rows in the cable pattern. You’ll need to keep these in mind if you’re designing or altering a pattern to make sure that the stitch pattern falls in the appropriate places on your garment. Knowing these will also make it easier to figure out your gauge for stitch patterns that are more difficult to count because of the arrangement of stitches within the pattern. Finding your gauge in pattern is the same as finding your stockinette gauge, you just have to be more aware of where your stitches are. To find your stitch gauge, count your stitches across horizontally. To find your row gauge, count your stitches vertically. This is where it’s helpful to know how many stitches make each pattern set, because then you can double check your numbers and orient yourself within your pattern. And trust me, it will only get easier the more you practice and more fluent you become in reading your knitting. 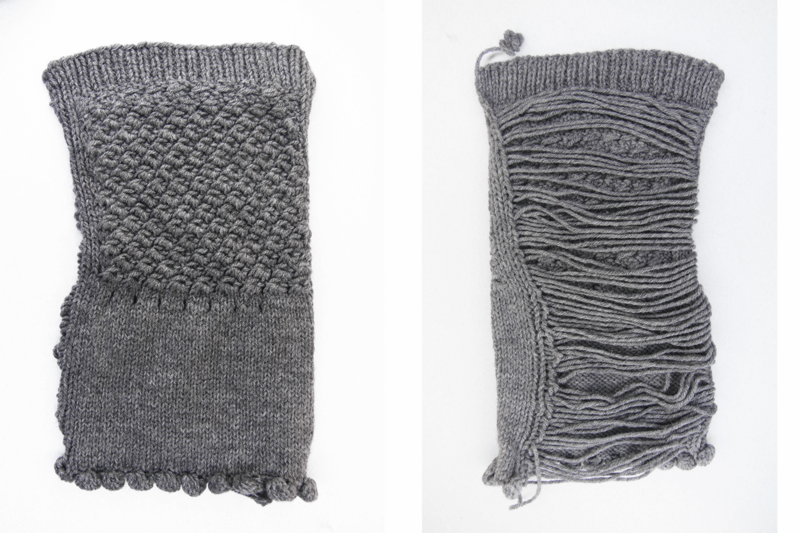 What If My Stockinette Gauge Is Different From My Pattern Gauge? It’s very likely that your stockinette gauge will be different from your stitch pattern or colorwork gauge, but that’s OK! Often if you’re following a pattern, you’ll just need to match your stockinette gauge (especially if no stitch pattern gauge is provided). In this case, as long as you’re achieving the suggested stockinette gauge, you can proceed with your project! If you’re designing your own item or you have significant portions of your item knit with stockinette with other portions knit in a stitch pattern you’ll need to make some adjustments. If your colorwork or stitch pattern gauge is different from your stockinette gauge, it’s important that both gauges match to ensure that each portion of your garment fits properly. For instance, if you’re only going to work a Fair Isle design on the yoke of a sweater, those stitches need to match the stockinette stitches you’re using on the sleeves and torso to avoid any fit issues. In this case, simply swatch your colorwork pattern until you achieve a gauge that matches the stockinette gauge you decided was appropriate for the piece. When it’s time to work the Fair Isle design, simply switch to the needle size you need to match the gauge of your stockinette stitches. Since everyone knits differently, there really isn’t a rule of thumb here. Some people will need to size up and others will need to size down. If you swatch consistently, you’ll start learning your knitting patterns, so you’ll have a better idea of which needles to start with when you’re working on matching gauges. We’ll have a crochet swatching series available in 2018 along with plenty of other posts that will help you improve your knitting, crocheting, spinning, and weaving! Let us know any other tips and techniques you’d like to learn in the comments! Liz is the Social Media Coordinator at WEBS. She's been knitting for ten years, has dabbled in crochet and weaving, and was even a seamstress during her college years. This entry was posted on Wednesday, December 27th, 2017 at 1:09 pm	and is filed under Tips & Techniques. You can follow any responses to this entry through the RSS 2.0 feed. You can skip to the end and leave a response. Pinging is currently not allowed.